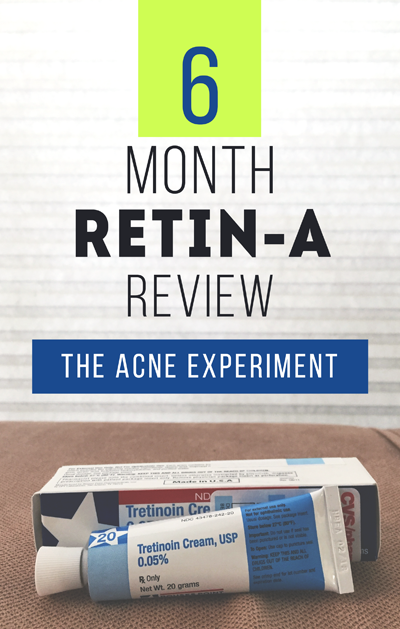 I scraped all my notes together and compiled a gigantic 6 month review of Retin-A (aka tretinoin, 0.05%, cream). Retin-A is not a natural cure, and I did get a prescription. I apologize to anyone that was hoping I'd stick to holistic products, or those that thought I'd only test OTC topicals. Please, good sirs, let me explain. I had excellent success with Retin-A in my twenties, but at some point during my last few years on it, that success shifted. I had always struggled with cystic hormonal acne on my chin, but I began to develop the same fine red forehead bumps that prompted me to begin using Retin-A in college. 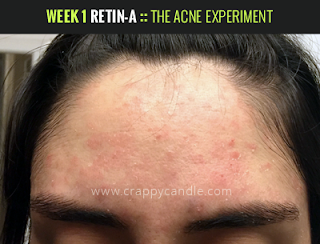 In my mind, the Retin-A had stopped working; I began dabbling in alternate acne treatments. After about a year of this, I started The Acne Experiment in earnest. That was two years ago. 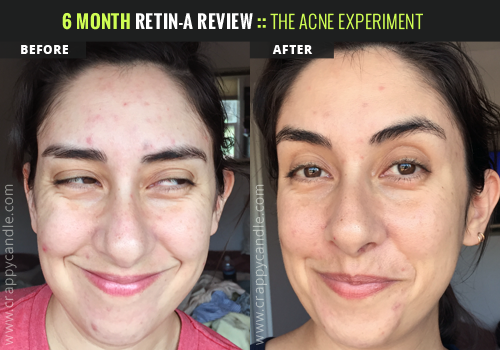 I began The Acne Experiment with the goal of putting together a streamlined, more natural routine, and in many ways that goal has been achieved. I discovered foaming cleansers were triggering frequent nasty chin zits, I folded a bunch of great holistic spot-treatments into my routine, I rediscovered a fantastic three ingredient skin mask, and – perhaps most important of all – I learned that certain "acne cures" just don't work for me. By testing a range of products & treatments, I stopped feeling like I was missing out on something, some holy grail product that would make me feel good about myself again. I'm stubborn, and it was preventing me from trying the one product that worked well for me in the past. And ironically, how very unscientific of me to NOT do a proper Retin-A trial. It's only one of the most consistently effective acne treatments of all time. I've done this before, so I'm practically a dermatologist. 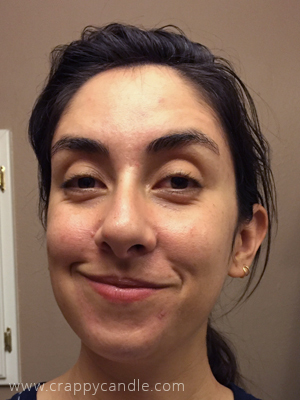 Here's what I do: Wash face, wait 10-30 minutes, apply a pea-sized amount of tretinoin (or less), wait 10-30 minutes, apply moisturizer. I could do this in my sleep. Purge? Purge who? I don't know her. Oh ok, right, this is a purge. Patiently wait for buttery soft skin like I had when I was 21. Mix up your routine girlfriend! Be flexible! Smile more! I (sobs) I'm not actually 21 anymore?? To clarify, I did go through a purge when I first used Retin-A in my early 20s. I don't remember how long it lasted, but I'm sure my baby brain thought it was the worst my skin would ever look. That compounded with the fact that I was frequently marinating in PBR and wine-in-a-sack means my memories probably aren't reliable either. 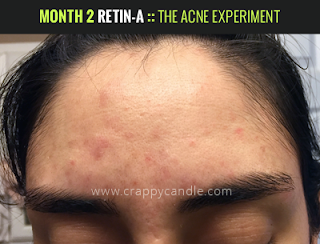 Anyway, in the name of science, I decided to plow through and apply the Retin-A every night, purge be damned. I kept a journal of sorts, because my baby brain is now a lady brain that was likely damaged by the cheap booze I drank in my youth. Look at what a happy little chipmunk I am. Week 0.5 – This is purging. Here we go... I've got purging + dryness on forehead, nose, and chin; My eyebrows have become a home for skin flakes. Week 1 – Haha no this is purging. I am splotchy as hell and bleeding everywhere. I'm still breaking out. There are new spots, but no big/nasty/inflamed situations. About a week ago, I started seeing improvements. Things look smoother, but I still have red spots. I'm still dry on my hairline and chin. My temples & chin are still dry. I've started using jojoba/tea tree oil as a kind of "spot moisturizer" a couple times a week. 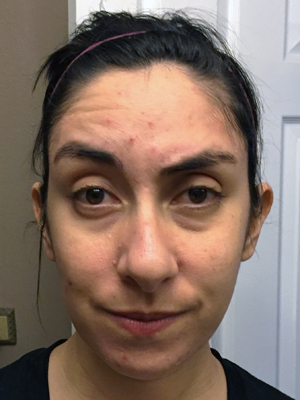 My forehead is mostly smooth, save for a couple superficial spots. Hyperpigmentations remain just about everywhere. My cheeks have gotten a little rough and dry. I'm not sure what that's about. This is the point in every product trial when you look in the mirror and say "Wow. 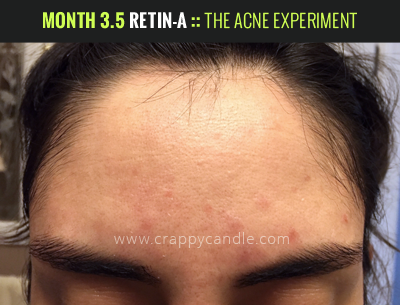 This acne treatment is really working." The acne fairy will then with gift you with 3 huge forehead zits. I'm seeing progress, baby! 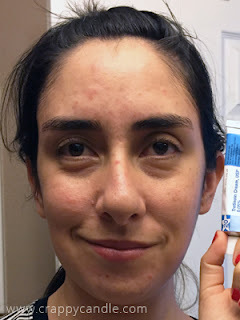 I figured out that by giving my skin a tretinoin break by using a clay mask once or twice a week really helps with the irritation. Also, if I do a cold water wash (with a wash cloth) before applying, I notice less problems. I should have been buffering with oil this whole time. It really helps with the irritation. I use jojoba with a teensy bit of tea tree oil in it. One drop for my chin, one drop for my temples/hairline, then spread it around my face. 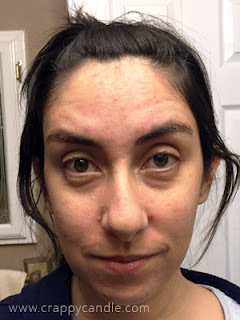 I've also been testing a morning toner (Andalou Naturals). Some redness/little bumps are cropping up around my temples. I'm not using the toner anymore, but I'm still using the oil. I'm still using the oil, but I also started testing micellar water (Marcelle) for the first time this month. I saw some nice improvements. It's not quite butter skin, but it's as close as I've gotten in the last two years. This is a win! Oh hai! I'm still relatively clear in the after pic! It's not perfect but is so much better than where I started. Things did get a little splotchy almost immediately after I took the month 6 photos, and for a period of time I thought that Retin-A wasn't going to work as well for me anymore. I thought maybe it was too harsh, or perhaps something else was going on. Last week a commenter brought to my attention the issue of isopropyl myristate in Retin-A cream. Isopropyl myristate is a problem ingredient for some people. 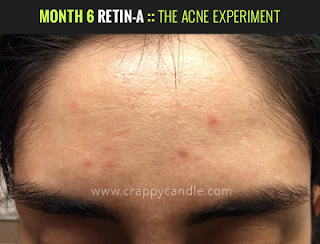 It is believed to be comedogenic*, which may seem odd given that Retin-A is primarily an acne medication. Ultimately, in my case, I figured out that it was more of a method & additional product issue, rather than an issue with the Retin-A itself, which was a relief. 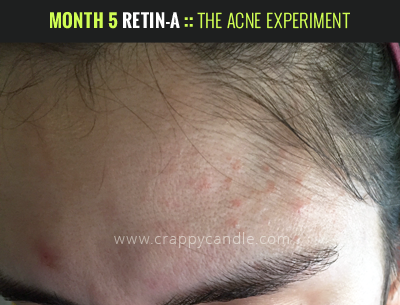 At this point, I've been using Retin-A for 8 months. 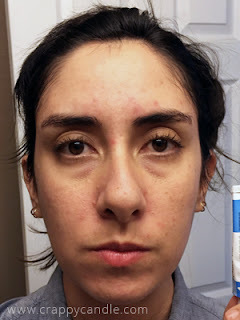 I'll be reviewing all the products that I tested concurrently with tretinoin along with the a couple of cleanser trials I did after month 6: Dermalogica Ultra Calming Cleanser & a cult-favorite micellar water (Bioderma). 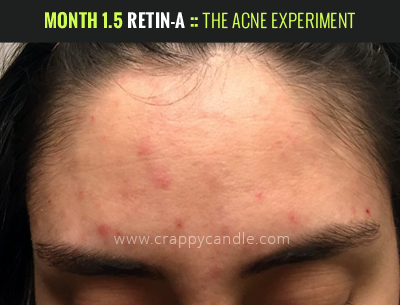 *Here's my take on comedogenic ratings: they are a good guideline, and can help pinpoint ingredients that are causing your skin problems, but they shouldn't be taken as gospel. This is because comedogenic ratings are made in a lab setting (ie not everyday conditions) on friggin' rabbit ears (ie not real human skin) at 100% concentration (eeeee). They don't take into account all the other variables that come into play with skincare, like hormones, allergies, nutrition, other products being used, concentration, other inactive/active ingredients, night drooling, etc etc. To compound this even further, everyone's skin is different. An ingredient that causes one person to break out could be completely benign on another. 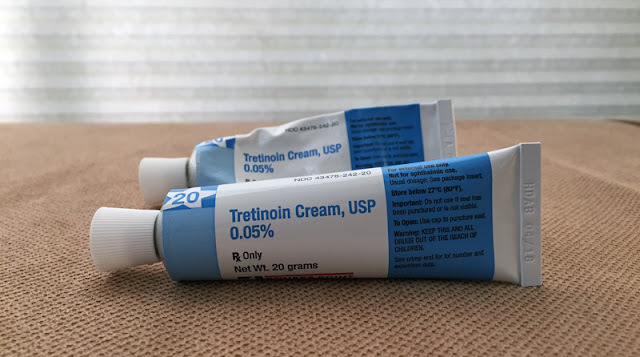 In the case of Retin-A, tretinoin is such a powerful topical that any negative pore-cloggy effects from the inactives is probably going to be nullified. So yeah, don't let the isopropyl myristate freak you out too much. Or, you know get some Retin-A micro instead. 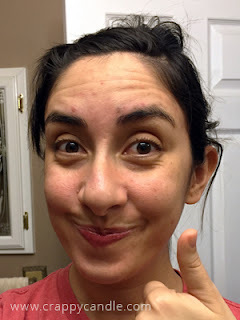 Did I see you mention in another post that you've struggled with perioral dermatitis? Any POD-related impacts or side effects with the retin-a? I used an otc retinol (paula's choice 1%) with some success a couple of years ago but since discontinued (why? I don't remember right now). In the meantime I've been dealing with some stubborn POD and >weee< a resurgence of acne. Thinking about trying the paula's choice retinol out again but I don't want to make the POD worse. Thoughts? I have mildish POD, but it's a stubborn little sucker (5 years!). I tried a little bit of Retin-A on it in the beginning of this trial, and learned that POD does not mesh with tretinoin. I would imagine retinol would have a similar effect. 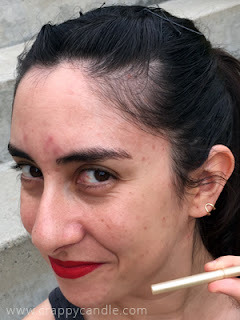 I apply the retin-a on my forehead, nose, and cheeks, but I don't apply anything below my mouth -- I draw an imaginary line from my mouth to about an inch below my ear and call that area the danger zone. 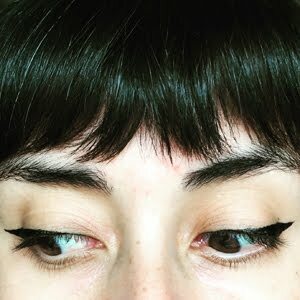 I also avoid applying above the top of my cheek bone (ie my eye area) because I started getting a wee bit of periocular dermatitis this year. I figured out that the only thing that doesn't cause the POD to flair is jojoba + tea tree oil. I'm in the process of treating it with a prescription regimen right now. I'm hoping that once it clears up, I'll be able to apply the retin-a everywhere without worry. 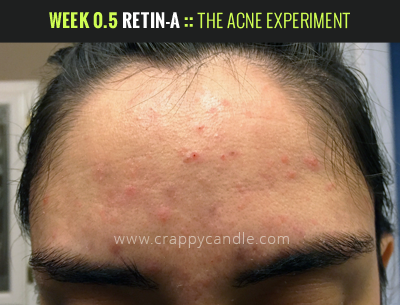 This is the best retin-a review. Especially loved the retin-a before and aftershots. You are a badass. Thanks for sharing your hilarious insights and pics. 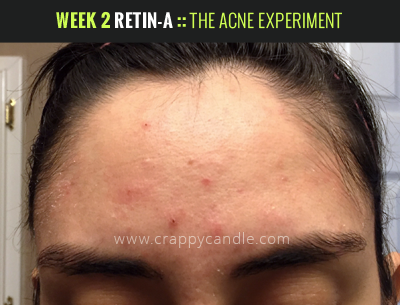 I'm still experiencing some peeling from retin-a, but I think it's worth it to see my skin clearing up.